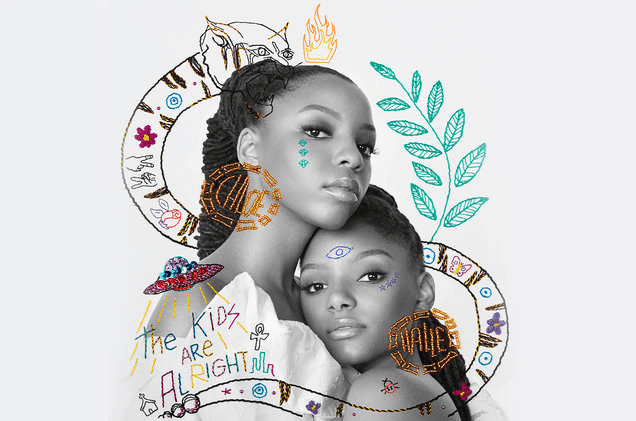 The Bailey Sisters; Chloe x Halle are blowing up the music stream when their debut album “The Kids are Alright” was released March 23rd. These young sisters has always been musically inspired way before the 2016 BET performance. Back in 2013, Beyoncé Knowles was the ones who discovered the musically talented sisters after seeing the Pretty Hurts cover on the Bailey sister’s You Tube page that went viral. What a great way to get Queen Bey’s attention. 2014 was a great year as the good news that they were signed to Bey’s Parkwood Entertainment Record Label made everything the sisters worked hard for stick to solid concrete. Way to go Chloe and Halle! The Kids are Alright and You can now download the entire album on Itunes Music today! ~Hello Friend (Intro) This is the very first song and I could feel the warmth of the introduction that talks about embracing the self-love of you. We all talk to ourselves sometimes and embrace life of our own. ~The Kids are Alright– This is the second song on the album. The beat and vocals on this track is so amazing. It’s just refreshing to hear the positivity energy of Chloe x Halle letting the world know that they are alright and they are here to stay for the long run. You can’t allow the world to steal your joy, so doing you and what makes you happy is the best meditation ever! Awesome sauce! ~Grown- Okay so we all should know that this is the theme song to Freeform’s new show “Grown-ish” starring Yara Shahidi (this show is off the charts!) It just basically tells the story of how they are at the point of life that they are mature and grown. We all have reached that point in our life when we start feeling ourselves and think we can do what we want to do. Lol. ~Everywhere- The fifth song on the album! “I got money everywhere falling off the trees….I got money everywhere as far as you can seeee….” Let’s make it rain yall because we got money everywhere we walk! Money cometh to me NOW! The beat to this track is Lit! And their vocals fits every beat and instrumental tune. ~Cool People- This song has that sweet medley in the beginning; soft-spoken and easy. This song is just a reminder that there are still cool and decent people in the world. ~Baby on the Plane- The opening to this song is sooo cute. A baby voice crying on a plane. I’m not sure what the inspiration was behind this particular track, but I love it indeed! My interpretation of this song is crying out all of your pain and worries. Overall the entire album is awesome! This is the type of music that should be on major radio stations all over the world! Music like this with a solid meaning on each of the track gives life to us all! That Riverz Gurl Media definitely rate the album a 10! Great job ladies! The Kids are Alright Musical Score with That Riverz Gurl Media Entertainment Website is a 10 ladies and gentlemen! Next Love N Hip Hop Just got Juicier! Erica Mena feeling Ms. Tommie Lee?